April 14, 2014 – With only one month of rehearsals, the whole cast of Sa Ngalan ng Pamilya eagerly waited for show time as the minutes ticked by. At exactly 8:00PM, the show started with an invocation through a video presentation, followed by the Philippine National Anthem. And then it was lights out. As the lights came back on, the act opened with the children busy with their gadgets, while “Inday” strutted her way to answer the door. The story revolves around a family, headed by Carlos as the very strict father, and Rosario as the submissive wife, and their seven children. With their father’s strict ways, the children rebelled against him which led to a tragic twist, leaving their mother stricken with unfathomable grief. The story ends when Carlos realizes his errant ways and takes the chance to change with the youngest who was the only one left. The play is an adaptation of Wilfrido Ma. Guerrero’s “The Forsaken House”, originally scripted in English and set in the 1970s. 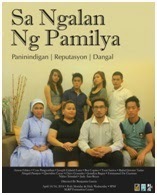 Re-written in Tagalog and adapted to present-day setting by yours truly, the play was presented by members of the Gospel Choir in cooperation with other members of the Music Min and Parish Youth Ministry as a fundraising activity to benefit all choir members – to fund a workshop for choirs. Future re-runs to a wider audience is still in the planning stage.